Want to say "I love you" or even "I like you" to someone special? 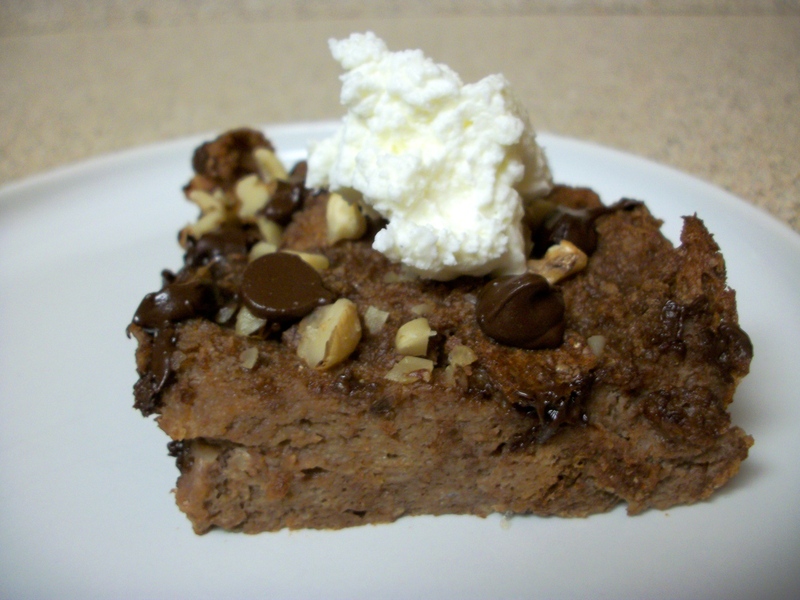 Present your beloved with a piece of luscious Double Chocolate Bread Pudding. With or without a dollop of whipped cream, you're sure to score brownie (or should I say bread pudding?) points. Double Chocolate Bread Pudding is both impressive and easy to make, which sounds like an oxymoron, but it's not. The great thing about this recipe is you probably have everything you need to make it right on hand. No need to buy a lot of ingredients you'll never use again. This dessert is actually made with healthful ingredients such as dark chocolate and walnuts and fiber-rich whole wheat bread (though you could substitute a nice challah). Plus, the sugar is kept to a minimum. I usually hate desserts deemed healthy and while this one isn't, it's not totally unhealthy either. For me, a dessert must, first and foremost, taste divine. This one definitely does. 3. In large mixing bowl, combine cocoa and sugar. Add 1/3 cup of milk and whisk until smooth. Add remaining milk, eggs and vanilla and whisk until well combined. Add bread pieces, mixing gently until all bread is moistened. Place mixture in refrigerator 1-4 hours. 4. Coat 8-inch square baking dish with cooking spray. Take cocoa-bread mixture out of refrigerator and stir well. Spread half of mixture in prepared pan. Sprinkle on half of chocolate chips and walnuts. 5. Top with rest of cocoa-bread mixture and the rest of the chocolate chips and walnuts. 6. Bake until knife inserted in center of pudding comes out clean, 30-40 minutes. Cut into squares and serve warm. Or cover with plastic wrap and refrigerate and serve cold. Top with a dollop of whipped cream if desired. Don't want to miss a Sugar Buzz Chicago post? Just type your email address in the box and click the "create subscription" button. There is no charge for the subscription. My list is completely spam free, and you can opt out at any time.